The water level of Lake of Bays reached seasonal low and started rising during this past week. The rising water level is due to melting of the near record snowpack. MNRF reports that about 25% of the snowpack melted over the past week. 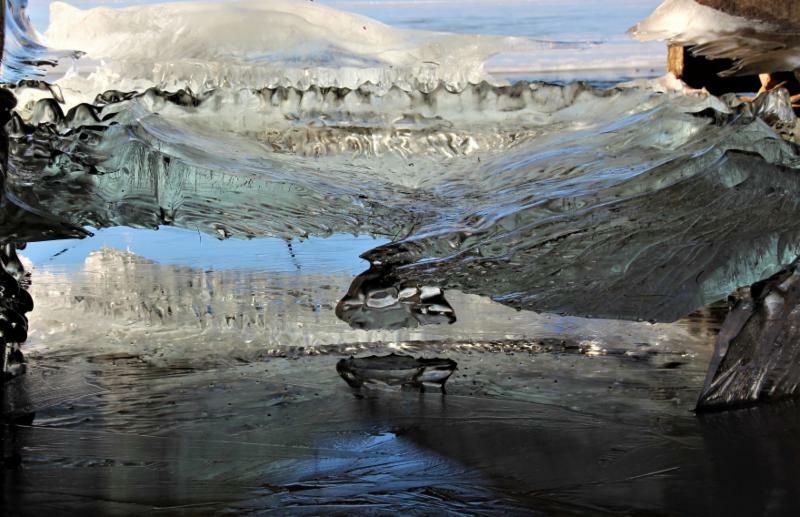 Melting is expected to accelerate due to the warmer temperatures forecast over the next week. ﻿Lakeside residents are advised that the imminent Colorado Low weather system which includes melting temperatures and periods of heavy rain will accelerate water inflows this week and is a precursor to flooding in the watershed. Lake water levels are expected to be higher than last year, due to the snowpack, and residents are cautioned to make sure personal effects have been cleared from low lying areas of their property, and on docks and in boathouses. Residents are also advised that thick lake ice combined with late melting create the potential for a late start to the boating season and wind-blown ice damage to shoreline structures. 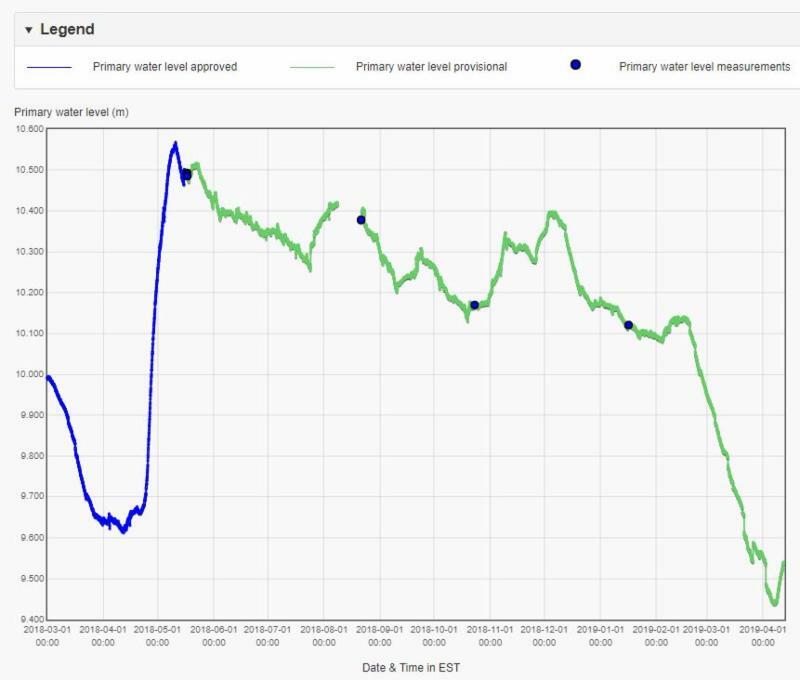 For Real Time Water Levels information at Baysville, click here . Last summer, with help from the Township of Lake of Bays and the Federation of Ontario Cottagers' Associations, LOBA posted CLEAN+DRAIN+DRY signs at all public boat launches on Lake of Bays. 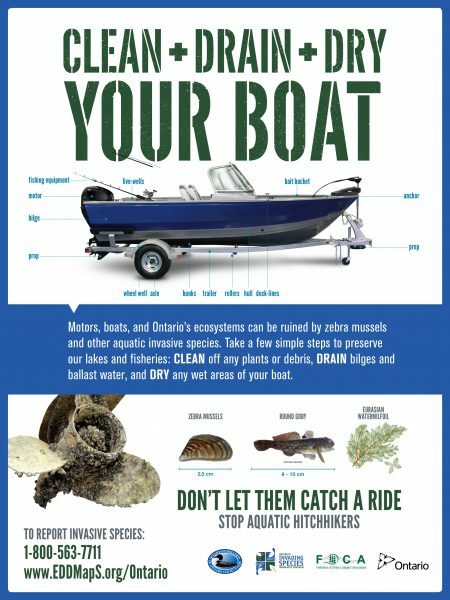 This summer we would like to reinforce the message by having volunteers spend time at those boat launches talking to boaters and handing out pamphlets. Time and location are completely flexible. If you are interested, contact Caroline Konarzewski at caromike@gmail.com . You might also be interested in three one-minute videos about Aquatic Invasive Species posted on the LOBA website. ﻿No matter where you live, you are in a watershed. Watersheds can be urban, rural, wild or anywhere in between. They come in all shapes and sizes and cross municipal, provincial and international boundary lines. Because all the water in a watershed shares the same fate and flows to the same place, watersheds are sensitive to pollution and land use, which can affect water quality not just in one watershed, but in all others downstream. What are the features in your watershed and how can you help protect them for future generations? How can you live and thrive in your watershed without decreasing the many ecological benefits that it provides? 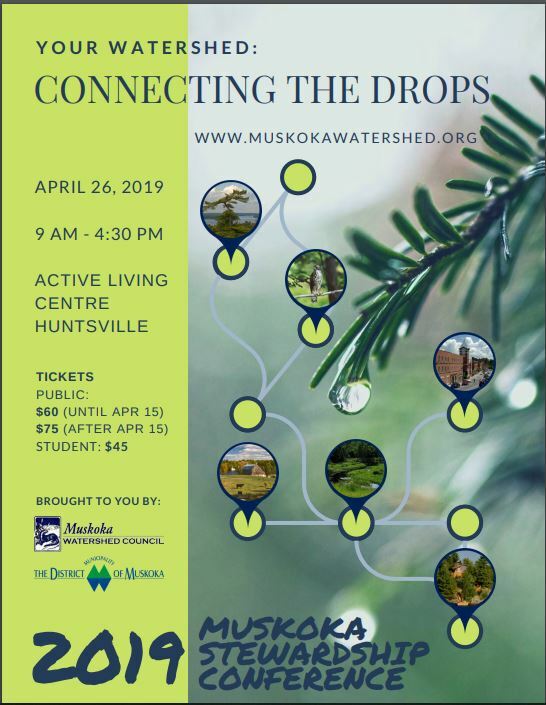 Come to the 2019 Muskoka Stewardship Conference where you will connect the drops on these topics, and more! Register by April 15 and save $15. ﻿ Get your tickets now for the ever-popular, always sold-out Baysville Friends of the Library Silent Auction and Dinner. 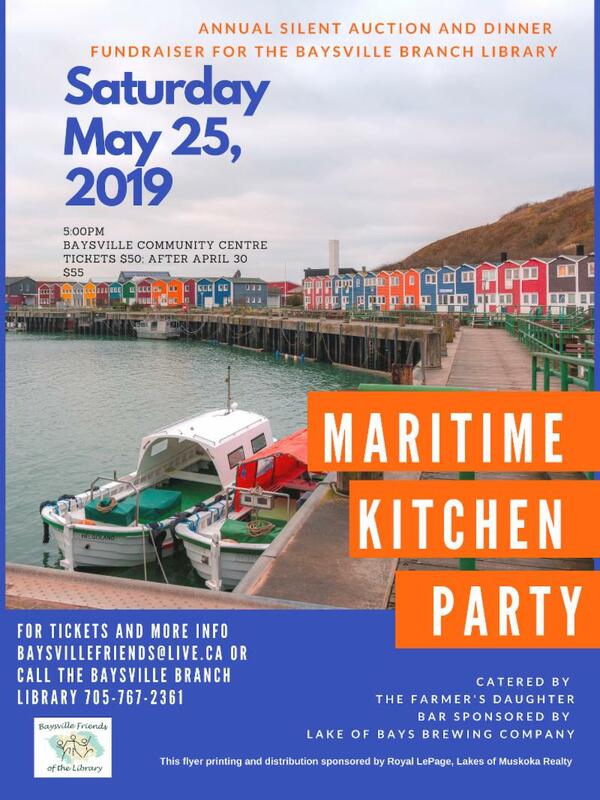 This year's Maritime Kitchen Party will include "Screeching-In" and Kiss-the-Cod, along with fabulous silent auction items and a fabulous dinner catered by The Farmer's Daughter . Don't delay in purchasing your tickets. You can pay in person at the Baysville Library by cash, cheque, Interac or credit card ( click here for hours ), by Interac e-Transfer to baysvillefriends@live.ca, by PayPal button at the Lake of Bays library website or by mailing a cheque to the Friends at P.O. Box 201, Baysville ON P0B 1A0. In 2018 the Friends purchased about 600 books and DVDs for the library, paid for over 30 magazine subscriptions and contributed $3,500 towards library programs and events for the entire Baysville community. They couldn't do this without the generous support of local permanent and seasonal residents. ﻿the Baysville Friends of the Library are coordinating a makeover to the entryway gardens at the Baysville Library/Arena. Read more about the project and how to donate here . Permanent and seasonal residents asked to participate. Summertime is when donations are needed most.